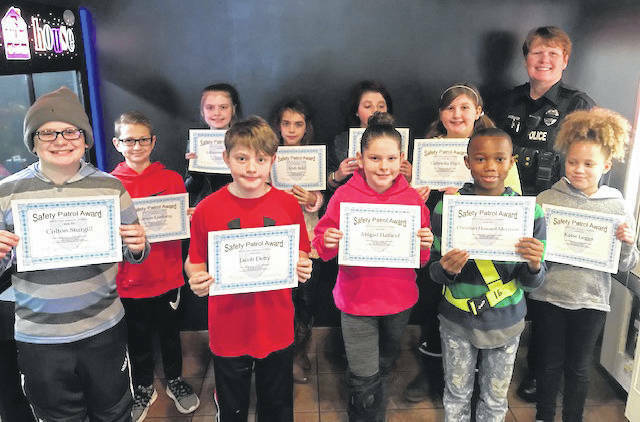 The students chosen as Safety Patrollers of the Month for January 2019 are pictured from left to right back row from Charles H. Huber Elementary Carson Limberg, Julieanna Biggs. From Wright Brothers Elememtary Andi Reid Sarah Teague. From Monticello Elementary Gabriella Fitch. School Resource Officer Shoemaker. Front row left to right from Rushmore Elementary Colton Sturgill and Jacob Detty. From Valley Forge Elementary Abigail Hatfield and Christian Howard and from Monticello Elementary Katie Leggs. Not pictured from Charles H. Huber Elementary is Hanna Todd. HUBER HEIGHTS — The Huber Heights Police Division wishes to recognize the Safety Patrol students for their hard work and determination in keeping students and citizens safe. The Huber Heights Police Division treats Safety Patrol students form each elementary school in Huber Heights to Ci Ci’s Pizza as part of a Safety Patrol of the month luncheon. The Safety Patrol Advisors from each elementary school nominate their best students for this each month. The Huber Heights Police give the students certificates, lunch with police officers and prizes for their hard work.